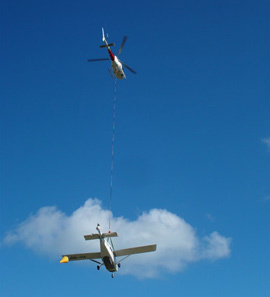 Helicopters are the lifting machine of choice for the hard to access site or if you want the job completed fast. Our fleet of helicopters are all capable of undertaking lifting operations to suit the individual needs of our clients, whether it be lifting a drill rig to a new mine site, lifting an air conditioning unit on to a building or constructing a transmission tower we can cater for all of your lifting requirements. Our helicopters are capable of lifting up to 1050kg. Click here to review our fleet. Our clients include the electrical transmission, mining, fire, forestry, tourism and television industry and private clients. We supply all of our own lifting equipment and utilise the most cost effective aircraft to suit your requirements. If you can't lift it with the aircraft we have, give us a call and we can arrange an aircraft to suit your requirements.